Firstly, let’s have a quick look at what Cisco SMARTnet Service is. Cisco SMARTnet Service is an award-winning technical support service that gives your IT staff direct, anytime access to Cisco experts and extensive Cisco.com resources. Cisco SMARTnet is essential to keeping your business functions available, secure, and operating at peak performance. Networks are the lifeline that connects your customers to goods and services, and the effects of downtime can be significant, decreasing productivity, eroding customer confidence, and losing revenue. How Does Cisco SMARTnet Help Solve Your Problems? As your network and data center evolve and you add new business processes, systems, and services, the consequences and costs of downtime increase dramatically, and delays in resolving issues can bring your business operations to a standstill. In addition, technology changes rapidly, and keeping your IT staff up to date on the latest advances and security issues can be challenging. •Quickly resolve issues: Identify and resolve problems quickly before they significantly affect business continuity. •Empower your IT staff: Improve operational efficiency by keeping your IT staff up to date on the latest technology advances and security threats. •Mitigate risk: Detect security issues that could negatively affect the availability, performance, and reliability of your network. •Fast support from experts: Connect directly to the Cisco Technical Assistance Center (TAC), staffed by thousands of certified Cisco professionals with experience diagnosing the toughest problems in your network and data center. •Online self-help support: Access extensive support resources 24 hours a day, 365 days a year through Cisco’s online knowledge base, communities, resources, and tools. 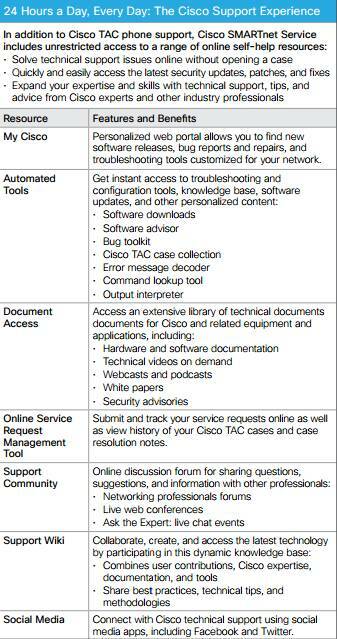 Table 1 shows the support resources available with Cisco SMARTnet Service. 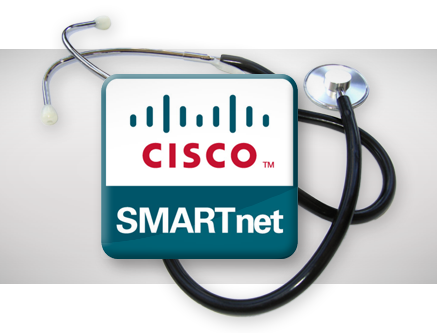 •Smart, proactive diagnostics: Gain critical insight with the embedded Cisco Smart Call Home feature, which offers detailed diagnostics and immediate alerts on enabled devices. •Ongoing operating system updates: Access new OS features, including both minor and major OS releases, with the latest operating system software updates within your licensed feature set. •Rapid hardware replacement: Get the coverage you need for each device with flexible hardware replacement options, including 2-hour, 4-hour, and next-businessday (NBD) advance replacement, as well as return for repair (RFR). •Onsite support: A certified field engineer will travel to your location to replace failed hardware under the optional onsite support. 1. Some equipment exclusions might apply; consult a service sales representative for more details. 2. Return for repair on select video products only. 4. Warranty only makes sure that software media is defect free and the software substantially conforms to published specifications. 5. Cisco Unified Computing System also includes ongoing downloads of BIOS, drivers, firmware, and Cisco Unified Computing System Manager (UCSM).